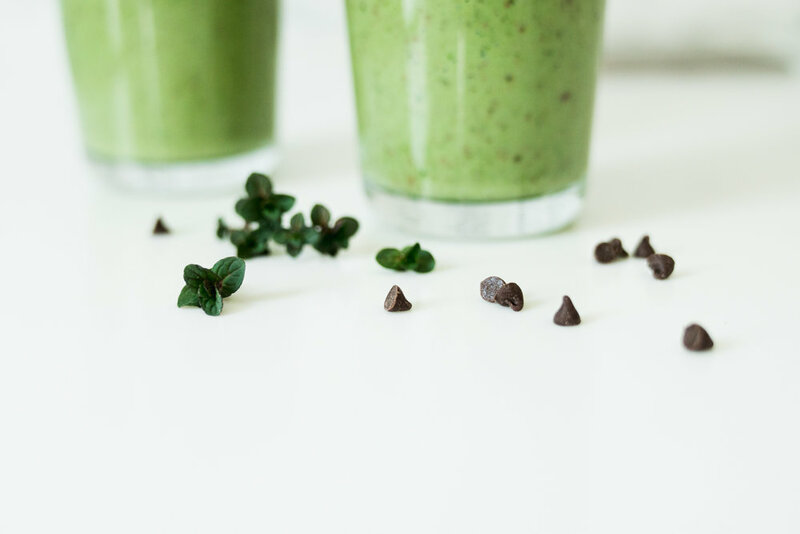 A healthy mint chocolate chip smoothie made with creamy avocado, spinach, silken tofu that tastes like mint chocolate chip. Secret ingredient? Optional CBD oil. This post is one part recipe for an amazing healthy, thick, dessert like smoothie with ingredients like avocado and spinach and one part intro to CBD oil (cannabidiol oil). So let's go over the smoothie first, and then those of you who are interested in a quick intro to CBD oil can stick around for that. Sound good? Okay, so smoothie. Anything called mint chocolate chip should be green in my humble opinion. I cannot express the disappointment I feel when I order or purchase anything mint chocolate chip and it's white. I know, I know...the green color was a marketing scheme but I grew up eating this in the 90's so it's just a weird childhood hangover. But now, as a dietitian I just don't like food coloring where it doesn't need to be. So we used natural colors: avocado, spirulina and spinach to give this rich green color. You've seen spirulina as an ingredient a few times (like in these spirulina overnight oats) on the blog since it has such a great color but also B vitamins and minerals. To make the smoothie thick with a rich, milkshake like texture, we used three ingredients: frozen banana, avocado, and silken tofu. My personal go-to is frozen banana, but I have a feeling there's going to be more silken tofu in our house (surprise Chris!). And for balance- for a healthy fat- protein- and of course fiber- all of these ingredients cross over. There's avocado for healthy fat, silken tofu for protein, and spinach and banana play into the fiber. Don't worry, this is definitely minty and chocolatey. Use peppermint extract and a fresh mint garnish (this is actually chocolate mint from my yard in the photo), and either cacao nibs (if you're into that...I am not- it tastes like mulch to me) or chocolate chips for the chocolate part. I should also mention our go-to reusable smoothie straws. I'm so surprised I haven't talked about these ever. We like boba/smoothie straws that are reusable because you don't feel like you're going to pass out from sucking up an overly thick smoothie up a skinny straw. If you're a smoothie person, I highly recommend picking up a pack. First thing first: this is not 'weed' or 'marijuana oil'. There is no THC (or at least only trace amounts depending on the brand) in industrial hemp CBD oil. Totally different things. I think there's a lot of mainstream confusion still surrounding CBD oil and industrial hemp in general because hemp ANYTHING was taboo for so long. And honestly, even as I first started researching CBD oil because I kept seeing it I ran into resources that contradicted each other. Like was it legal? Was it not legal? (Long story short-it doesn't have the psychoactive compound THC- industrial hemp CBD oil is legal). Once I started seeing it mentioned in multiple places in my world I knew I needed to learn more so I could answer questions about it, but also consider adding it to my wellness routine. I've done Instagram LIVEs before and mentioned adaptogens several times. More specifically, ashwagandha. For me, ashwagandha has been my go-to product for dealing with high stress levels and besides meditation, has been the only thing that has worked well for me. But one of the many benefits to CBD oil is just that- less stress, less anxiety, anti=inflammatory properties...there are several benefits. And then it fell into my lap. I was in New York for a quick work related trip (Cherry Bombe Jubilee) and I fit in some meetings. One of which was to go see the crew at MindBodyGreen (remember last year they named me America's Next Great Nutritionist?). Liz, their food editor, had a ton of product on her desk and she very generously gave me a bottle. So like I said said CBD oil fell into my lap after I had been researching it. Very cool. After using it for a few days, Chris and I are big fans so far. We are very cautious of any potential placebo effects and we are both very in touch with our bodies reactions to things. It makes us both very go-with-the-flow and reduces out stress responses. The other weird thing....we check out social media/phones/email less. By a lot. I'll be sharing more in depth things about CBD oil on Five Minute Monday over on Instagram LIVE and I think from that will come a detailed blog post. Stay tuned. My point is if you have it, you can definitely add it to the smoothie. If you want to learn more, wait until next Monday and tune in LIVE. Add all ingredients except chocolate chips to a blender. Add chocolate chips. Blend for a few seconds.